It is always fun for us “shop people” to get a new toy. I have been struggling with an old, 1 hp Craftsman band saw for the past 20 years or so. As my rocking chair business continues to grow, it is vital to have machinery that will help me produce the quality that is required. As such, I am excited to say that I just set up in my shop a new Laguna 14” SUV 240v 3hp band saw. Pictures accompany this blog. It is a beautiful machine, over 50% heavier than my previous band saw, and cuts hardwoods like “butter”. She is “blonde.” She is tough…but with smooth edges. She lights up a room. She is life. She is part of my legacy. I would like to introduce you to Hailey. She is the newest member of our rocking chair family. It is no coincidence that she is named after my first granddaughter, who exhibits many of the same characteristics. Hailey, my granddaughter, was the first girl born into my family since 1919, so she has a special place in my heart. 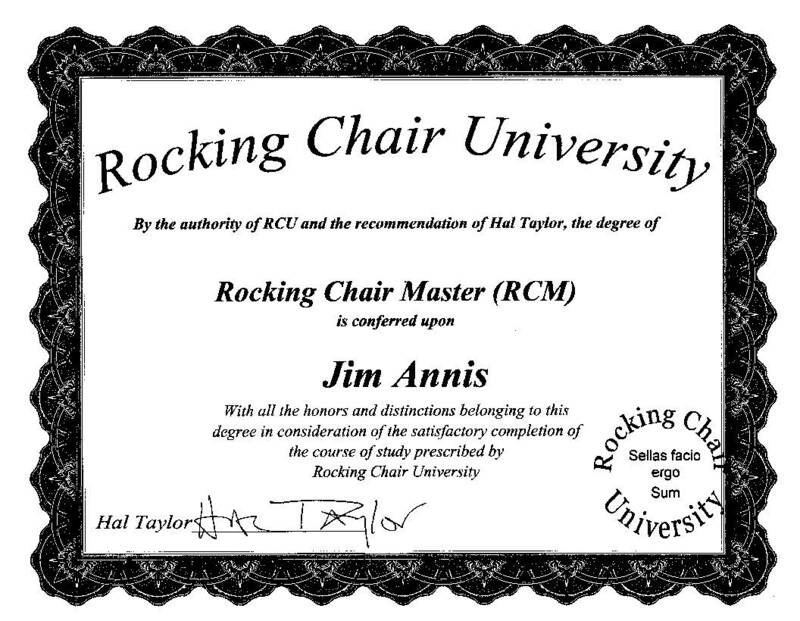 Hailey, the rocking chair, was created in a special place called Rocking Chair University. 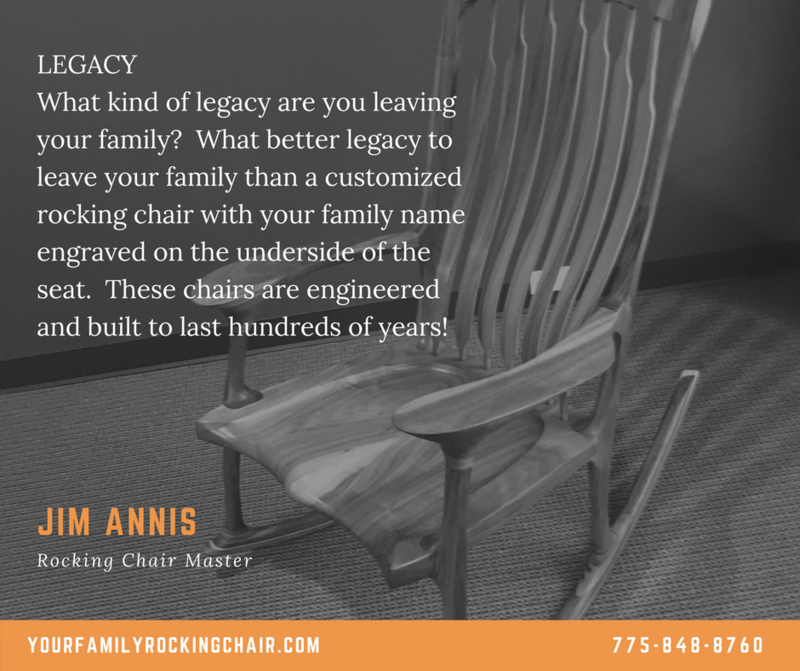 When I knew that creating rocking chairs was my passion, I wanted to hone my skills at the famed training center in Virginia. I prepared for months. 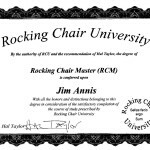 I was gone from my “day job” (a company that I own) for eight days in Virginia learning to be a rocking chair master. These pictures of Hailey are the results of that work. The wood is curly maple. This chair now sits in our home in Reno, Nevada. Where will your chair rock away the hours in your place? I have several passions in life. Among them are rocking chair making and golf. I am a certified (if not certifiable ) custom, heirloom rocking chair maker. 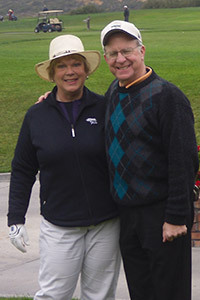 I am a decent golfer, a mid-to high single digit golfer who has had a couple of even-par career rounds in my life. Believe it or not, the similarities between golf and chair making are many. To wit. VISUALIZATION techniques apply. Consider the fact that we know that it will take about 40 board feet to make a chair out of 8/4 lumber. So, we need to closely look at the wood and first observe the sapwood, observe the sides of the wood for indications of interesting grain and observe where there are or are NOT knots in the wood. Then, we need to match interesting grains of wood for the seat, the back legs, the headrest and the arms, as “mirrored” grain is preferred in these parts of the chair. Then, we need to visualize how the “accent” laminations look and we will need to include that consideration in the making process. The point is that, before one grain of wood is cut, I know what my plan is and I visualize that outcome, and, in chair making, the execution is much more predictable! g and golf we start with voluminous activity. 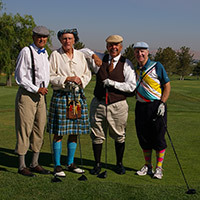 The drive in golf is the longest hit in golf. For me, my average drive is 230-250 yards. Pros hit the ball well over 300 yards. For me, as a short hitter, ACCURACY is very important. For the pros, accuracy is not as important. Their concern is distance….volume. In making rocking chairs, the first activity is voluminous as well. We take boards that are 2” thick by 10-12” wide by 8-10 FEET long and out of those boards we make “billets”…..billets for rockers, billets for back braces, billets for arms, billets for the headrest and we band saw out the basic forms of the front legs and the back legs. Finally, we need to cut out the large pieces for the seat…either a two-piece seat or a four-piece seat. Unlike my golf game, accuracy is not vital in the rocking chair making voluminous activity, although it does help in the long run because if you are more accurate in this process there will be less grinding and sanding later. 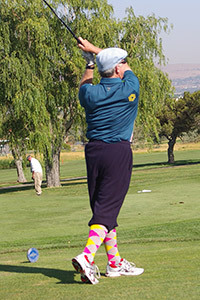 In golf, the approach shot is usually hit with an “iron”. The intent is to hit the green to get ready for putting the ball in the hole. There are many variables that need to be taken into consideration for this shot. (1) Many times the shot choice you are given is a function of the “lie” of the ball…hardpan surface, fairway sitting up, in the rough, etc. Spin is important in golf and the lie on your approach shot will dictate the spin you can put on the ball and will help you hit the green….or not. (2) Wind. Is the wind in your face….directly or at an angle? How hard is the wind? (3) Where are the sandtraps? Most golf architects will design a “bail out” area on a green, usually far from the flagstick…that risk-reward thing. (4) Where is the flagstick? Do I pin-seek or play for the center of the green? (5) What is the speed of the greens? The speed dictate if you NEED to be below the hole at all times. 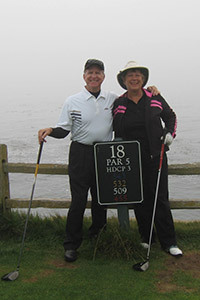 Variables abound……which is what makes golf so interesting to play. I relate this phase in the rocking chair making process to “assembly”. One of the beautiful things about wood is that it is not perfect. As a result, when we are assembling the components of the rocking chair, there can be many variables. (1) Fit. This is the stage where, among other things, we attach the legs to the seat. Fit is vital. A visual seam is not permissible. Great pain is taken to provide a perfect fit, including planing all surfaces. (2) Repetition of Form. In this stage, we also do a lot of grinding and sanding. The sawdust really flies! The repetition of form is one of the things that makes this rocking chair special, so this step is very important. (3) Headrest and back braces. In this step the back braces and headrest are installed. The headrest gives the chair that unique “wrap around” feel and the back brace shapes make the chair distinctive. Great care must be given here. (4) Chip out. Chip out is a real variable when working with wood, and we must be prepared for that to happen. Keep slivers of wood that match. Keep matching sawdust. Keep your cut-outs handy. We do all of these to repair the inevitable chip-out or mistake. Like golf, the variables in this stage add to the beauty of this perfect, imperfect process of making an heirloom quality rocking chair. The golf hole ends with a “feel” shot. If you don’t hit the green with your approach shot, you are generally left with a chip shot or a pitch shot. These shots are very delicate shots to coax the ball toward the hole without the ball going too far past the hole. These shots take alot of practice and encompass a lot of “feel”….feeling the club head make contact with the ball. Secondly, there is no shot in golf that is more a “feel” stroke than the putt. Those who play golf know the difficulty in stroking the ball correctly, at the right angle, at the right speed, to drop into that 4 ¼” hole. A missed 3” putt counts the same as a 300 yard drive. Once the rocking chair is assembled, the “fine tuning” happens. This is where the chair is sanded to a 600 grit and then the wood is polished with abralon, not removing any wood but removing remaining filaments. This process takes hours and IS ALL ABOUT FEEL. During this process we are constantly feeling the wood, searching for high spots, rough spots, low spots, tough spots. Transitions need to be perfect. Synthetic steel wool is used to get to the difficult locations. A rough transition is the same as a missed 3” putt….you work so hard to get there and an error of “feel” leaves less than a perfect chair. There is a saying in golf: You drive for show and you putt for dough $$”. What this means is that the long, voluminous drive is not as valuable as being a good putter. The same applied to rocking chair making. If you cut the big pieces perfectly, but don’t accomplish the “feel” portion of the chair, your results will not be what you want or expect! 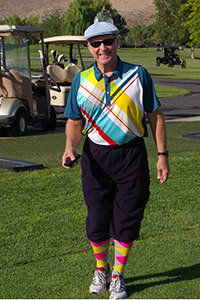 Fortunately, I am a really good putter! In baseball, I love playing “catch”. As a kid, I played catch with my friends east of San Francisco for hours on end. We “were” always Juan Marichal pitching, or Willie Mays making that great throw…or…we were simply playing catch getting updated on what was happening as we were listening to a Giants game on the radio. As my first son was born, “playing catch” with him was the quintessential father-son activity, as we would toss that perfect sphere forEVER! In fact, he went on to play baseball in college. The conversation during these “catches” for a father-son are amazing…the same is had when fishing, or hiking, or……………….. I played catch with my dad, but we did one thing better. He built a small home in 1950. I was not born yet, so I could not help him build it. But, when I was 10 or so, he built a workshop in the back yard. That was the beginning of my dad and me doing woodworking projects together. He then bought some commercial real estate and I helped with those chores, all the time learning about woodworking. Just like when playing catch, or fishing, or hiking, the wonderful conversions between a father and son when working with wood are WONDERFUL. Similarly, my younger son had no interest in baseball BUT any project I was doing around the house he was right there building it with me…from gates to doors to bookcases….and this son got his degree in Theatrical Design and Construction and is a master carpenter. The perfect fit of a mitered edge rivals that of a perfectly placed curve ball! I am lucky that each boy was interested in one of my passions!